The blockage last week of SOPA, the Stop Online Piracy Act of 2012, is a tentative victory not only for net neutrality and changing definitions of intellectual property, but also an impressive display of new online organizing. SOPA is the first of what will likely be several attempts to censor the Internet, under the logic of media’s intellectual property law. Nominally, the act would have shut down offshore torrenting sites, a move which the FBI already took in part on Jan. 19, when massive file share sites Megaupload and Megavideo were shut down. Actually, the law would have the capacity to shut down or censor some of the most trafficked sites, including Facebook, Twitter and Google, as well as numerous smaller sites with much less clout and bargaining influence. SOPA is not the last we’ve seen of the push to censor the Internet. As our modes of information access have shifted from newspapers and libraries to the vast universe of the web, law, especially intellectual property law, has struggled to keep up. It’s no secret that record sales, newspaper sales, movie attendance and other hallmarks of our media-saturated era have plunged in recent years, and the industries have scrambled to save their bottom lines. 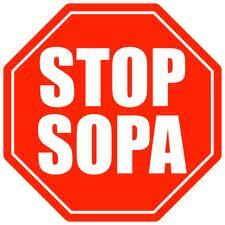 SOPA and its ilk will not go without a fight. The most interesting outcome, then, of the SOPA debacle is the massive backlash from the general public. Goaded in part by blackouts of popular sites such as Wikipedia and Reddit, millions of angry consumers signed petitions large and small to “save the Internet!” The sites in blackout, and even those that weren’t, linked viewers to a place where they could look up their representative and send an email in protest, as well as sign a petition. People’s activist fervor, at least as exhibited through Facebook and Twitter, was overwhelming. Seasoned organizers might argue that anything done in front of a computer screen is not activism but “slacktivism”; yet behold, the architects of the bill have backed down and vowed to go back to the drawing board. How SOPA is critical, is determined by the means we had to use to protest it, indicating ever more clearly the Internet’s omnipotence and almost crippling power in our lives. A censorship of the Internet would be a censorship of the people’s power, through the means we in the developed world now use to express it. The anti-SOPA petitions are a heartening harbinger of the massive quantities of fervor and activism, even via the Internet, waiting to be tapped. This was a large-scale version of the rapid-fire Change.org petitions that stunned corporations, such as Molly Katchpole’s Change.org petition against Bank of America‘s proposed $5 fee for debit card usage. Katchpole, a 22-year-old nanny (and full disclosure, a former coworker of mine), collected 300,000 signatures through an online petition and the bank relented. Several months later, SOPA protests ignited the same kind of public fervor, just on a larger scale. Both protests indicate the ubiquity and power of online organizing, and both capture public distress at a time when banks and governments are overstepping their limits more than ever. Attempts to legislate the Internet will not go away. The Internet is a relatively young place and as such is inevitably going to be reined in as the boundaries of authority shift with the meaning of intellectual property. Fortunately, the medium shapes the message, and the millions of signatures, calls and emails to our representatives indicate how the general online public can organize not just for net neutrality, but for anything.